All businesses want to reach out to as many customers as possible, and that’s where a great social media strategy pays huge dividends. Traditionally, businesses have used every trick in the book to try and get themselves mentioned in print media, but nowadays social channels throw that out of the window with famous faces on Twitter commanding massive followings at the touch of a button. The Small Business Sunday result? 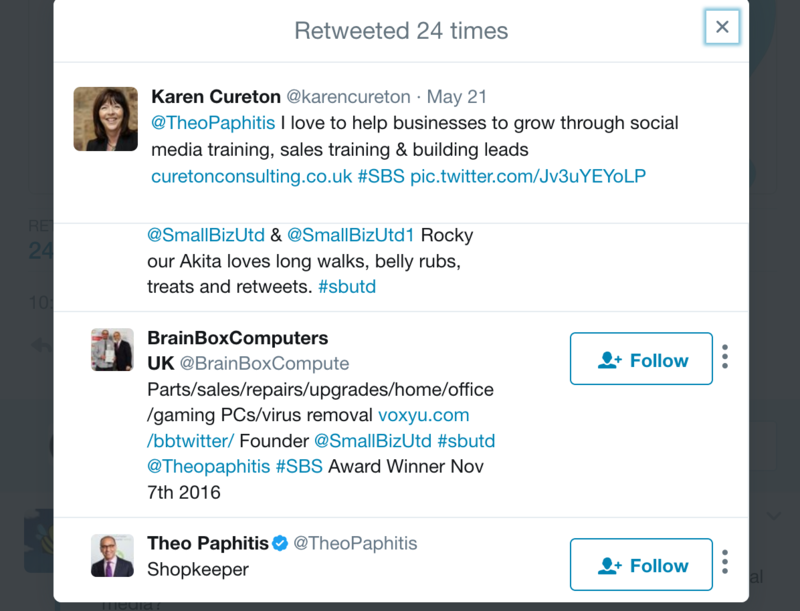 Theo Paphitis retweeted my message and chose me as one of his businesses of the week! Now, when you consider that Theo commands just over half a million followers, that is a massive boost for my business. The most recent figures show that The Daily Express has 100,000 fewer readers with sales of 391,626 a day – so you can see how powerful Twitter really is. The next day, Theo mentioned me again in his Tweet congratulating the week’s Small Business winners, which was then retweeted 93 times, and liked 132 times. That means my business name has reached half a million people, twice! So how to do it? The first big lesson with social media is to keep your message consistent and relevant. My tweet worked because I did it on the right day, to the right person, and my message was simple and relevant. Always remember that as with all media, messages you post on social platforms stick around. So have a clear strategy about what you want to put across and stick to it. Keep all your posts consistent to the theme and you will start to build up a clear brand identity. Fail to keep your posts relevant and consistent, and you will quickly confuse customers with what you are saying.